Infrastructure plays a vital role in economic growth, and over the past year we’ve seen the beginnings of bipartisan support, at least rhetorically, for increased investment in the nation’s infrastructure. But supporters of infrastructure investment often have conflicting ideas about which level of government will provide that investment. The Trump administration’s infrastructure plan—at least what we know of it so far—would leave state and local governments to pick up at least 80 percent of the increased investment. In contrast, Senate Democrats recently proposed a $1 trillion infrastructure plan constituted entirely of federally funded and financed investment. This report looks at different factors—including but not limited to economic efficiency—that policymakers consider when seeking to determine what is the most appropriate division among federal, state, and local governments for funding, financing, and overseeing infrastructure investment. Some contend that it is most economically efficient for state and local governments to play the larger role in infrastructure investment, with the federal government having only a small role. But the case for this is actually quite weak, as we show below. And the benefits of a strong role for the federal government in funding, financing, and overseeing infrastructure investments are, in fact, often greater than advertised. The federal government can help mitigate infrastructure funding challenges at the state level during economic downturns. The ups and downs of the business cycle can make it difficult for states to maintain stable levels of infrastructure investment. While states’ balanced budget requirements generally do not apply to capital investment, many states still fund infrastructure on a pay-as-you-go basis. During economic downturns—when states’ tax revenues decrease and social services spending increases—state-funded infrastructure is likely to suffer from neglect. The federal government can play a role in mitigating this challenge. Because the federal government can run deficits—even quite large ones over the short run—it is well positioned to help states maintain stable or increasing infrastructure investment over the course of a business cycle. Infrastructure user fee pricing mechanisms are the best funding option for ensuring economic efficiency; such mechanisms can be managed at any level of government. An infrastructure funding system is most economically efficient when the beneficiaries pay the full cost of the benefits they receive. Some say that state and local governments should pay for state and local infrastructure projects, arguing that the beneficiaries of this infrastructure are taxpayers in those states and localities. But determining who the beneficiaries are is actually more complicated than that. For this reason, infrastructure user fee pricing mechanisms are a better choice for ensuring economic efficiency. Infrastructure that is funded by user fees can be financed and managed at any level of government—federal, state, or local. Because most infrastructure is connected to regional or national infrastructure networks, a federal role in infrastructure investment has greater benefits for economic efficiency than is often assumed. Networks involve economies of scale and positive spillover effects that may not be taken into account by state and local government infrastructure decisions. The federal government may be better positioned than states to make infrastructure decisions that most effectively and efficiently integrate the network. The federal government can play an important role in pricing externalities. When infrastructure policy aims to maximize economic efficiency, costs need to be measured correctly to ensure infrastructure users are paying the full cost. This means, for example, that the externalities of carbon emissions must be taken into account in pricing the use of transportation infrastructure. Because carbon emissions have the same impact on the global climate regardless of where they are emitted, all states share responsibility for this impact and need to share the cost in order for pricing to be economically efficient; however, when states set carbon pricing independently, they may choose not to bear the full cost (or any cost). The federal government may therefore be better positioned than state and local governments to set efficient carbon prices. A federal role can help ensure equitable access to infrastructure for all citizens. Policymakers don’t only consider economic efficiency when making decisions about infrastructure investments. Often, they wish to ensure that basic needs—for example, clean drinking water—are met for all citizens regardless of their ability to pay. When equity—rather than economic efficiency—is the primary goal, such infrastructure investments may be better handled by the federal government, which is better positioned to assure access to all citizens regardless of where they live and regardless of local economic conditions. The Great Recession and a slow recovery in its wake have led Washington policymakers to focus recently on short-term boosts to infrastructure investment as a way to stimulate the economy. In the near term, the economy will likely continue to remain below full employment, and short-term boosts in infrastructure investment could stimulate aggregate demand and boost job growth if accommodated by the Federal Reserve (Bivens 2017b). This near-term boost would also cut into the estimated $2.1 trillion funding gap needed to boost our infrastructure to a state of good repair, as reported by the American Society of Civil Engineers (ASCE 2016). Getting the economy quickly back to full employment could also stem the recent deceleration in productivity growth that is likely a result of a prolonged period of weak aggregate demand (Bivens 2017a). In the long run, infrastructure contributes to the nation’s public capital stock. Such investment has historically been provided by the public because infrastructure typically has natural monopoly characteristics. Building a water utility involves enormous upfront fixed costs, but once that infrastructure is in place, an additional gallon of water can be provided to a household at a low marginal cost. If infrastructure investment were left to the private sector, once the infrastructure were in place a private firm could easily keep new market entrants out by underbidding them. This market power allows the private monopoly to hike prices, degrade service quality, and undersupply infrastructure goods and services. Given that a substantial government role is already required to prevent such abuses in infrastructure management and pricing, often it has been simpler for the government to provide the infrastructure itself. Private capital increases productivity growth through capital-deepening—giving workers more tools and machines so they can produce more in an hour of work. And private producers rely on the nation’s public capital stock—the systems of roads, bridges, and airports, for example—when supplying their goods to the market. Theoretically, the role played by public capital in the production process means that allowing the nation’s stock of public capital to decline could slow private-sector productivity growth. As Figure A shows, higher public capital is indeed associated with faster productivity growth. Bivens (2017b) details that the economic evidence supports a substantial impact from public investment on productivity. Early work by Aschauer (1989, 1990) found a return to public capital that was about three times higher than the return to private capital. These estimates were then criticized by a following round of researchers but recent research—notably by Heintz (2010)—has addressed these criticisms while still finding very large rates of return to public investment. Is the current mix of government involvement for funding, financing, and managing infrastructure investments optimal? The evidence noted above argues strongly that a permanent increase in public investment—including the “core” infrastructure1 this report focuses on—may help to partially reverse the recent slowdown to productivity growth. But noting the broad benefits of a permanent increase in infrastructure investment does not clarify what are the proper roles to be played by federal, state, and local governments in this investment. The rest of this report focuses on this question. We begin by detailing the historical roles played by these different levels of government. Total public spending on transportation and water infrastructure2 was $416 billion in 2014. Of that total, just 23 percent came from the federal government, with the vast majority—77 percent—coming from state and local governments (CBO 2015). Historically speaking, state and local governments have consistently taken responsibility for the majority of spending on transportation and water infrastructure but to varying degrees at different times. Figure B shows the percentages contributed by the federal government and by state and local governments to total public spending on transportation and water infrastructure from 1956 to 2014. Following the passing of the Federal-Aid Highway Act of 1956—which enabled construction of the country’s interstate highway system—the federal government’s role in infrastructure ramped up considerably. In 1956, the federal percentage of public spending on transportation and water infrastructure was 15 percent; by 1960, it was 31 percent. 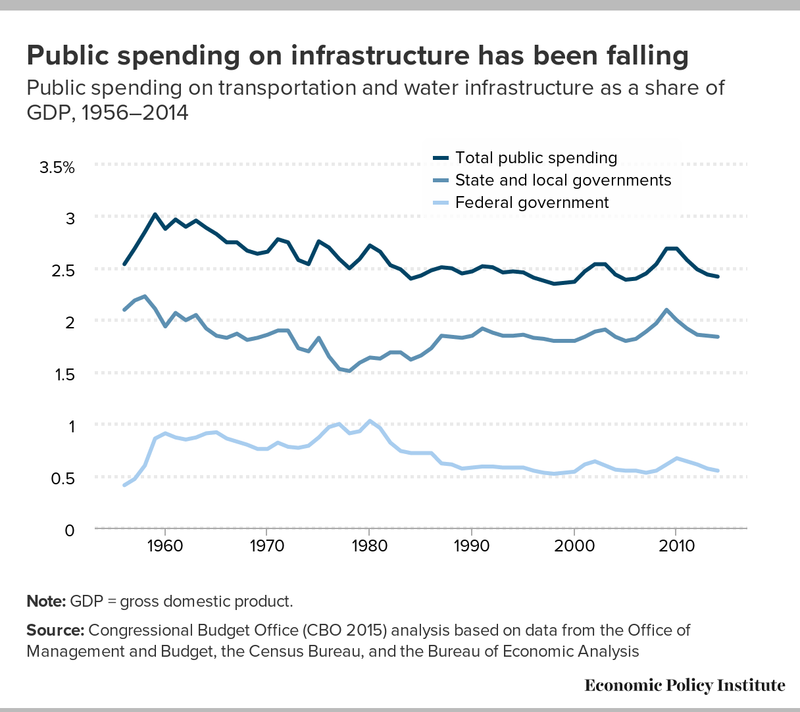 Between 1959 and 1975, the federal share of infrastructure spending averaged 30 percent; that share increased further in 1976, hovering between 35 and 38 percent until 1981, when it began to decline. The federal percentage of spending on transportation and water infrastructure averaged 25 percent between 1987 and 2014; in 2014, it sat at 23 percent. Behind these numbers lie considerable differences in how the types of transportation and water infrastructure spending are apportioned among different levels of government. Federal government spending leans more heavily toward capital investment; in 2014, the federal government’s share of capital spending was 38 percent. Federal contributions make up a much smaller percentage of spending on operations and maintenance—12 percent in 2014. (Total public capital spending on transportation and water infrastructure was $181 billion in 2014, while total spending on operations and maintenance was $235 billion.) 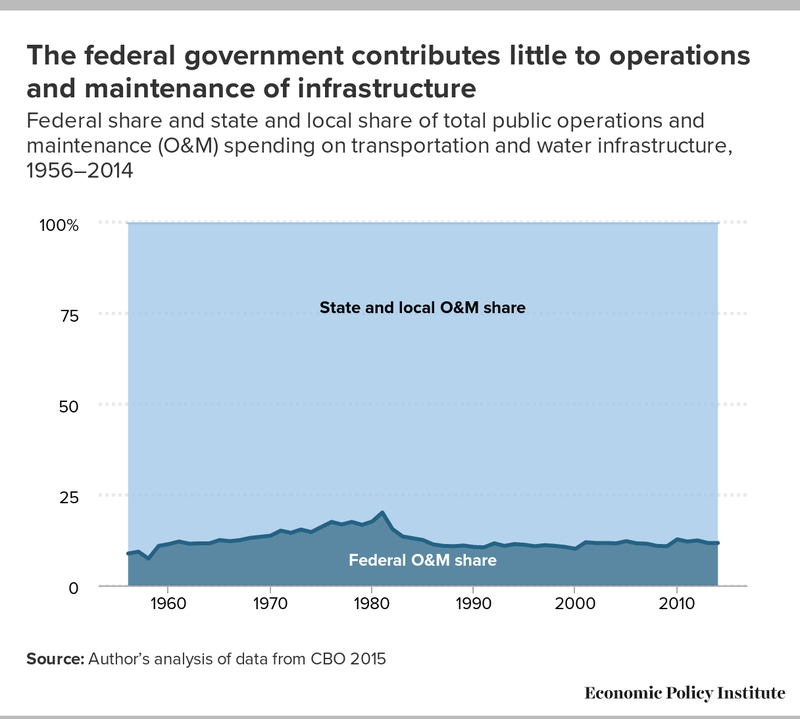 Though state and local governments bear the heavier burden for both types of transportation and water infrastructure spending, they must spend a much larger share of their dollars on operations and maintenance than on capital investments. 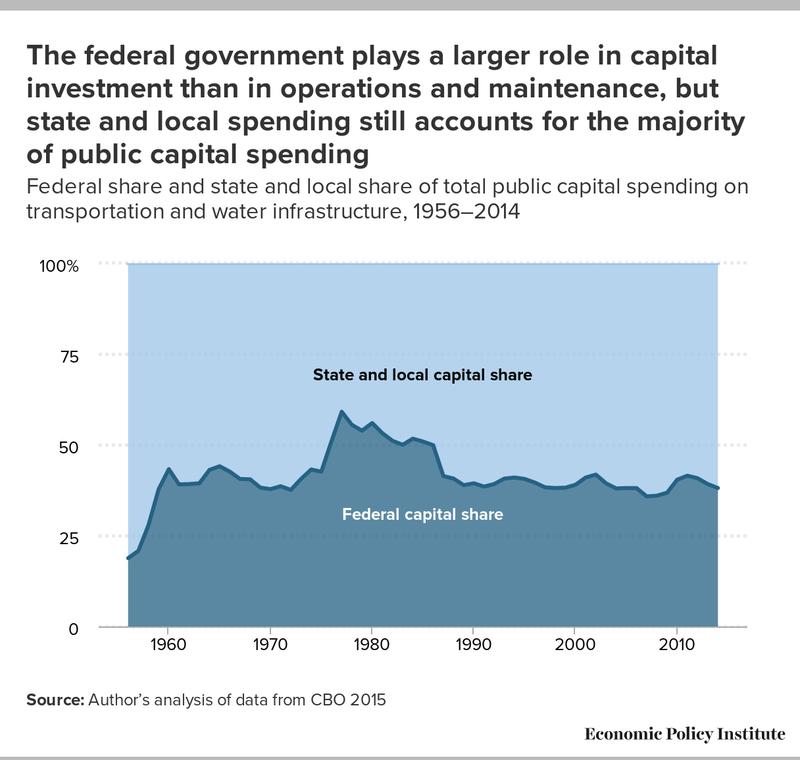 Figure C shows the percentage of public capital spending on transportation and water infrastructure that came from the federal government and the percentage that came from state and local governments each year from 1956 to 2014. Figure D shows the shares each contributed to operations and maintenance spending during those same years. While most states and localities are theoretically capable of maintaining a stable permanent increase in infrastructure investment over the course of a business cycle, their balanced budget requirements may mean they are not the optimal government entities to do so. As a legal matter, states are generally required to balance their budgets. Since states do not print their own money, this requirement makes some economic sense—it prevents states from being forced into a self-fulfilling liquidity crisis by herd-driven financial markets (which can happen even in cases where a state’s debt would otherwise have been sustainable in the long term).3 But capital expenditures have long-term benefits, and states and localities are aware of this. For this reason, most states have separate operating and capital accounts, with the capital account being exempt from balanced budget requirements. This allows states to borrow money to finance the large upfront fixed costs associated with infrastructure and spread the funding out over time. However, this type of borrowing doesn’t happen for all states. McNichol (2017) notes that 22 states fund infrastructure on a pay-as-you-go basis, paying for capital projects with cash on hand. If a state chooses to fund infrastructure on a pay-as-you-go basis, a recession can cause serious problems for maintaining stable levels of infrastructure investment across the business cycle. As people lose their jobs, state government spending on Medicaid, Unemployment Insurance, and other social programs increases. At the same time, revenues slump due to lower income, sales, and property tax receipts. The fiscal strain caused by higher spending and lower revenues makes it more likely that infrastructure investment will be neglected during these periods. As we will detail later, infrastructure is often part of a network; to optimize efficiency within a network, consistent investments are needed throughout the system—not just in states willing to borrow to invest in infrastructure. In the absence of changes to the laws or traditions of those 22 states, there is a clear case for a strong federal role to maintain stable infrastructure investment over the business cycle. For states that do utilize the bond market extensively to finance infrastructure spending, recessions may still cause problems. Theoretically, assuming nothing happens to the funding behind capital projects, capital accounts allow states to maintain (or even increase countercyclically) their investments in infrastructure. Figure E, which tracks state and local government debt since 1992 as a percentage of GDP, appears to lend support to this theory. 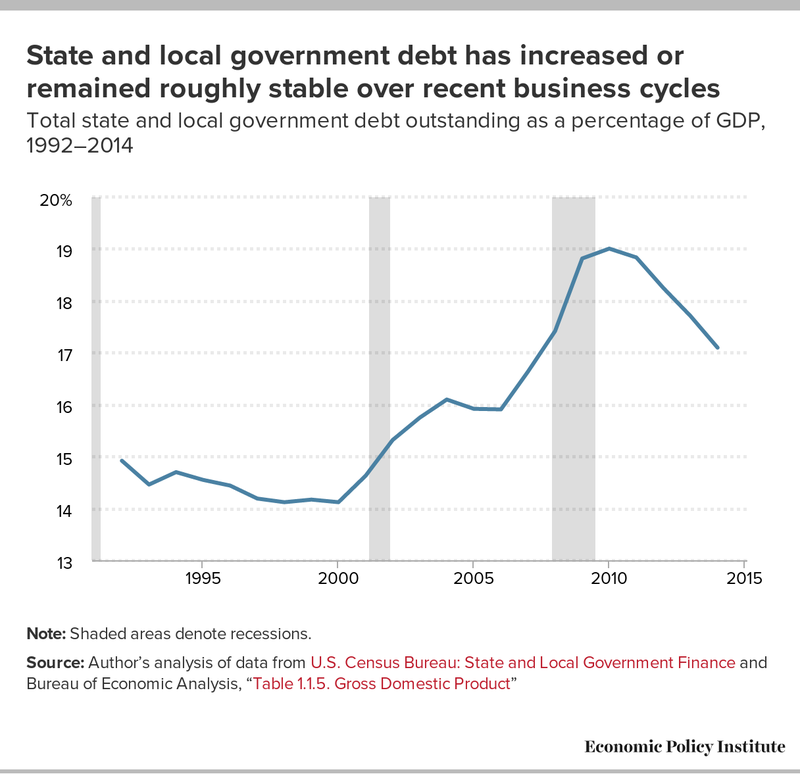 Over the course of the business cycle, state and local government debt seems to average out to imply stable investment (albeit with a significant increase in state and local government debt even over the business cycle expansion from 2001–2007). 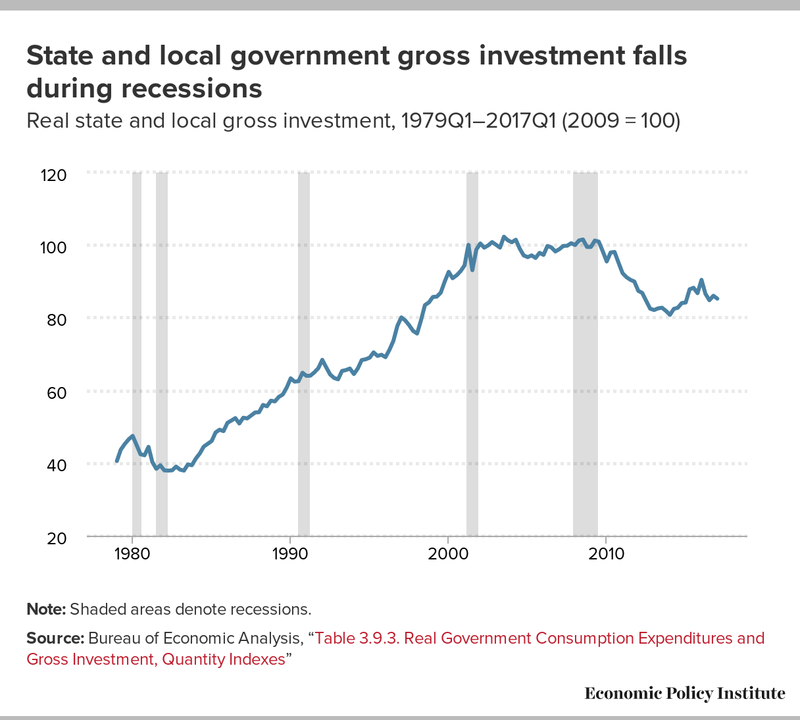 But on the whole, as shown in Figure F (which follows state and local government gross investment since 1979), there appears to be some evidence that state and local gross investment falls during recessions. During the recession periods4 since 1980 the average annualized growth rate of state and local gross investment was -0.6 percent, compared with an average annualized growth rate of 2.2 percent during the intervening nonrecession periods. On its face, this evidence seems clear cut: it shows that state and local gross investment5 tends to decline during recessionary periods and increase during nonrecessionary periods. However, it is important to note that these averages may not be fully representative of typical spending trends during recessionary versus nonrecessionary periods. The negative average growth rate for recession periods is driven by a steep decline during the 1980 recession. Without factoring in the 1980 recession, the average annualized growth rate would be 2.5 percent. On the other hand, the average nonrecession period growth rate is pulled down considerably by an unusually long period of decline during the post-2010 period, which was clearly a function of the enormous damage to tax collections inflicted by the Great Recession and the slow recovery in its aftermath. Without the post-2010 decline, the nonrecessionary growth rate would be even higher, at 3.6 percent. Regardless, it seems clear that, in general, state and local gross investment spending is more likely to falter in recessionary periods than in nonrecessionary periods. Of course, a simple comparison between recessionary and nonrecessionary periods does not take into account other possible factors influencing state and local gross investment. For instance, 2010 saw Republican wins in many state-level elections. Many of these Republicans ran on strong spending-cut platforms, and the subsequent fall in state investment post 2010 could have been driven more by political decisions than by genuine fiscal strain. On the whole, however, the evidence from Figure F suggests that we should be concerned about the ability of state and local governments to sustain investment in the face of recessions. Additionally, the combination of state funding and financing of infrastructure with the desire to impose user fees to provide the revenue streams and bolster economic efficiency can put great pressure on states. As we will discuss in more detail later in the paper, imposing user fees is good for economic efficiency, and it is often claimed (with far less evidence) that state direction of infrastructure investments is somehow more efficient than federally directed efforts. But relying on user fees can put great pressure on states’ ability to maintain consistent investment effort over the business cycle. For instance, investments in roads and bridges have often been funded by gas taxes. The historical purpose of gas taxes was to approximate user fees. Driving more meant filling up the gas tank more, which in turn meant that heavy road users would pay more in taxes at the pump. This logic has been slowly breaking down in recent years with the increase in the number of hybrid and electric vehicles on the roads—drivers of these vehicles pay a lower gas tax per mile (or none at all), making the gas tax a less meaningful way of collecting user fees for road usage. For this reason, some states are experimenting with new funding mechanisms, such as mileage-based user fees. To get a sense of how such a funding mechanism might interact with future business cycles, let’s look at historical trends in vehicle miles traveled (VMT) in relation to business cycles. Figure G shows a 12-month rolling average of vehicle miles traveled for the years from 1970 to 2017. Recession periods are shaded. If a state or locality were to fund a road with some type of user fee on vehicles, a revenue projection made before the most recent recession likely would have followed the general upward trend in VMT. 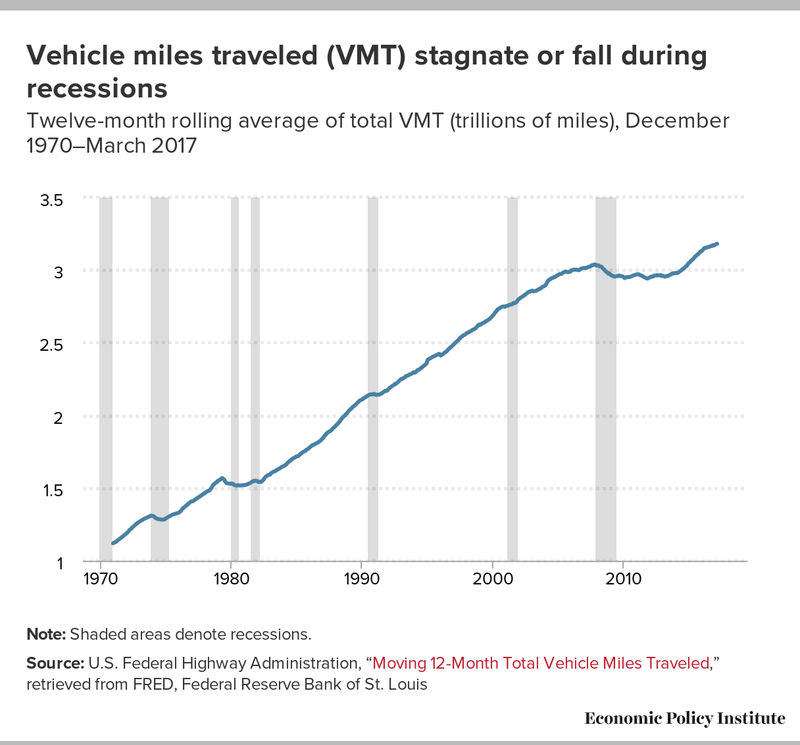 But during recessions, VMT has historically declined or stagnated—and during the most recent recession this decline was quite sharp: it declined by 3.2 percent, from a high of 3.04 trillion miles in late 2007 to its business cycle low of 2.94 trillion miles in late 2011, and did not regain its late-2007 level until late 2014. Air traffic control provides another example of how economic shocks can cause a decline in revenue coming from a user fee funding source. Britain and Canada both have commercialized air traffic control systems that fund their services through user fees. But the airline industry downturn in 2000—intensified by 9/11 and the 2003 SARS outbreak—would bring both countries’ air traffic control systems to the brink of insolvency (GAO 2005). Since infrastructure projects would be financed long term through capital accounts, it is unclear the extent to which such declines in revenues would impact state and local government finances during a downturn. But user fees become yet one more declining revenue source during a recession, and the decline in user fee revenue can add to the strain on a state’s budget; this interaction between user fees and state budgets should certainly be considered. In fact, state and local governments have an option to offload the risk of declining revenue sources onto private capital. They can finance with a revenue bond, which is tied to the specific revenue-generating source—for example, a toll on a new road—instead of general obligation bonds. But private capital holders will require a higher interest rate to take on that risk, thereby increasing the long-term cost of financing the infrastructure project to the municipality. It is worth noting here, though we will turn to public-private partnerships (P3s) in more detail later in the report, that increasingly state and local governments are using P3s to finance infrastructure investment. Such P3s are often funded by user fees, and demand risk (the possibility that there may be fewer cars on the road paying tolls than originally anticipated) can be a serious concern for the structure of P3 contracts. When the number of infrastructure users goes down during an economic downturn, a P3 may be brought near insolvency. In such cases, the private partner often engages in opportunistic renegotiation in an attempt to be bailed out by the public partner (Engel, Fischer, and Galetovic 2014). Too often this effort succeeds and the public partner ends up shouldering the demand risk (Blair 2017). Insofar as infrastructure investment is used as a stimulus measure, the federal government has an advantage in undertaking this during an economic downturn. Fiscal strain may make some states that fund infrastructure investment on a pay-as-you-go basis unable to engage in infrastructure investment during a downturn, while it may make others more reluctant to do so. And while state and local governments without pay-as-you-go laws or traditions appear to keep long-term debt stable over business cycles—as would be necessary to maintain stable investment over the business cycle—the funding and financing these states utilize have the potential to cause fiscal strain or even lead to the type of self-fulfilling liquidity crisis mentioned above. The federal government has fewer constraints than state and local governments when attempting to ensure strong permanent investment in infrastructure that remains stable even as the economy sinks into recession. In theory, state capital accounts should allow states to maintain stable infrastructure investment over the course of a business cycle without running afoul of legal requirements to balance budgets. In practice, however, states often face challenges to doing so. A strong federal government role in a permanent infrastructure investment could mitigate or avoid these challenges. Almost half of states finance infrastructure on a pay-as-you-go basis, and bond proceeds make up less than 10 percent of financing for capital projects in 17 states (McNichol 2017). As we will detail, the network characteristics of much infrastructure means that a permanent increase in infrastructure investment should be sustained across states to maximize national benefits. But if some states are unwilling to finance infrastructure with long-term debt, their infrastructure spending is likely to decline during economic downturns as state and local budgets undergo fiscal strain. Infrastructure projects should not be abandoned or delayed in any state simply due to poor business cycle timing. And while states that do use long-term debt considerably to finance infrastructure investment have been willing to keep such debt stable over the course of the business cycle, they are not immune to the ups and downs of the business cycle. The extent to which P3s and user fees are involved in respectively financing and funding infrastructure can cause fiscal headaches. Unlike state and local governments, the federal government is able to run quite large short-term deficits—and during a recession doing so is good for the economy. The federal government can absorb declining revenues, including declining user fee revenues, without necessitating a spending cut. The federal government is well positioned to maintain stable infrastructure investment over the course of the business cycle, by ramping up its investment to offset declining state and local investment during economic downturns. Broadly speaking, for infrastructure investment to be provided in an economically efficient way, those that benefit from a particular project should bear the cost. If the full cost is not borne by beneficiaries, too much may be consumed or provided. If those bearing the costs do not receive much of the benefit, too little may end up being provided. The Congressional Budget Office (CBO 2015), among others, uses this understanding of economic efficiency to define what it sees as the appropriate roles of federal, state, and local governments in infrastructure. CBO argues that to avoid inefficiencies, the federal government should fund projects that benefit the nation as a whole, while projects that benefit only particular states or localities should be left to their respective governments. This type of argument is often used as the de facto reasoning for assigning further responsibility for infrastructure funding to state and local governments. But state and local governments are already responsible for the vast majority of infrastructure funding, even as the funding gap continues to widen. In the following sections, we argue for a broader understanding of economic efficiency that isn’t defined by a simple breakdown into federal or state and local beneficiaries, and we argue that user fees are a better means of ensuring economic efficiency than attempting to assign beneficiaries to specific levels of government. Infrastructure provision involves two distinct aspects that are often conflated—funding and financing (Blair 2017). We will dig into the efficiency implications of financing a bit later, but for now let’s focus on funding. Funding refers to how infrastructure is eventually paid for—through some combination of user fees and taxes (Geddes 2015). The extent to which the beneficiaries of infrastructure ultimately bear its costs depends mostly on the funding mechanism. Some examples should make this clear. As we noted above, historically the gas tax has been used to fund surface transportation infrastructure by approximating road usage. However, as the number of hybrid and electric vehicles increases, the gas tax’s usefulness as an approximation of usage is declining. Ignoring for a moment the externalities associated with carbon emissions, this means that the gas tax is doing a worse job of making sure that those that benefit from roads pay for their costs. Electric vehicles allow users to obtain all the benefits of road usage while incurring almost none of the costs. This makes the gas tax a less economically efficient funding source. What’s relevant for our argument is that this is clearly true regardless of who is imposing the gas tax (state, local, or federal government agency) or which roads are being used (a local city’s road, a state highway, or a national interstate). A user fee—when it correctly measures usage—is substantially better able to ensure costs are paid by beneficiaries when compared with simply assigning state, local, or federal governments to fund, finance, or manage infrastructure. While intuitively it may appear that the beneficiaries of local roads are local residents, and hence anything that ensures these local residents fund infrastructure will improve efficiency, the correspondence between geography and efficiency of infrastructure provision breaks down pretty quickly on close analysis. Maybe a city road should mostly be paid for by the city’s residents, as they will obtain most of the benefits. But if funding came solely from a local government income tax, other (nonlocal) households who benefit from the roads would receive those benefits without paying for them. For example, if the road is used to transport a consumer good from a local company to a nonlocal consumer, the end consumer will not pay for the use of the road despite having benefited from it. Because some beneficiaries are not bearing the cost of their usage, we can expect that these local roads will eventually be underprovided. On the other hand, a direct user fee would ensure that the beneficiaries eventually pay the costs (in our example, the cost of tolls paid by the truck driver would be passed through to the end consumer as an increase in shipping costs), no matter what level of government has assigned the cost, thus ensuring that road usage will be priced efficiently and the road maintained at a level commensurate with usage. To build on this example, let’s consider the trucking industry more generally. The benefits of highway interstate infrastructure are national and diffuse, so it is more efficient for the federal government to fund the interstates—which are heavily used by the trucking industry. The beneficiaries of trucking are likewise national and diffuse. But the damage that trucks impose on roads varies substantially with axle weight. Assigning interstate road costs in the most economically efficient way, therefore, would entail a pricing mechanism that is able to adjust the user fee to the weight of the truck rather than simply using a “one size fits all” mileage-based user fee. Crucially, which level of government manages the infrastructure is not nearly as relevant for economically efficient infrastructure provision as the infrastructure’s pricing (which, when utilized, is often its funding source). These examples have focused on roads, but similar arguments can be made for the relevance of user fees for economic efficiency in other types of infrastructure. Breaking apart responsibility for infrastructure among state, local, and federal governments may get close to beneficiaries bearing the full costs, but user fees get far closer no matter which level of government undertakes the investment. Some might wonder whether it’s possible to assign a price to infrastructure because they think of infrastructure as a public good. But in economic terms, “public good” usually refers to a good that is nonexcludable (those who don’t pay can’t be excluded) and nonrival (consumption by one person does not prevent consumption by another)—and infrastructure is generally not treated as a “public good” in this sense. Instead, the economic case for public provision of infrastructure more commonly rests on claims that infrastructure investments tend to have the characteristics of natural monopoly—and are thereby open to abuses when managed privately. Because, in economic terms, infrastructure is generally considered to be excludable—it is usually possible to exclude those who haven’t paid to use a piece of infrastructure, for example, through tolls, utility bills, or other user fees—there is no reason that infrastructure cannot be appropriately priced as such. And, in principle, there is no reason a state or local government is in a better or worse position to use an economically efficient pricing mechanism than the federal government. User fee–funded infrastructure can, in theory, be managed at any level of government. The federal government could play a useful role in helping states and localities better use pricing mechanisms for infrastructure provision. One example is electronic tolling. Recent technology has made electronic tolling a considerably easier way to collect user fees for road usage—which is particularly useful as the gas tax stops functioning as an accurate user fee (though it continues to be a good way to price carbon emission externalities). But the network characteristics of our highway system create a problem, as states must negotiate with one another to create interoperable electronic toll systems. The electronic toll systems of most states are still not widely interoperable, despite the 2012 enactment of the Moving Ahead for Progress in the 21st Century Act (MAP-21), which required “that all Federal-aid highway toll facilities provide for the interoperability of electronic toll collection by October 1, 2016” (FHWA 2012). One option for the federal government to help states and localities reach a more efficient user fee for road usage is to lean more heavily on compliance with this law, making it easier to collect tolls from nonlocal road users. State and local households would also likely be more receptive to participating in electronic toll collection programs if they knew they would be able to use their transponders across the national network. Apart from the funding mechanism, infrastructure provision also requires upfront financing of capital investments. Since a defining characteristic of infrastructure is its large upfront fixed costs, and user fees and tax revenues only come in gradually over time, financing is needed to bridge the gap. For governments the typical source of financing is bonds. The federal government sells Treasuries, and states and localities sell municipal bonds (on which earned interest is exempt from federal taxes). 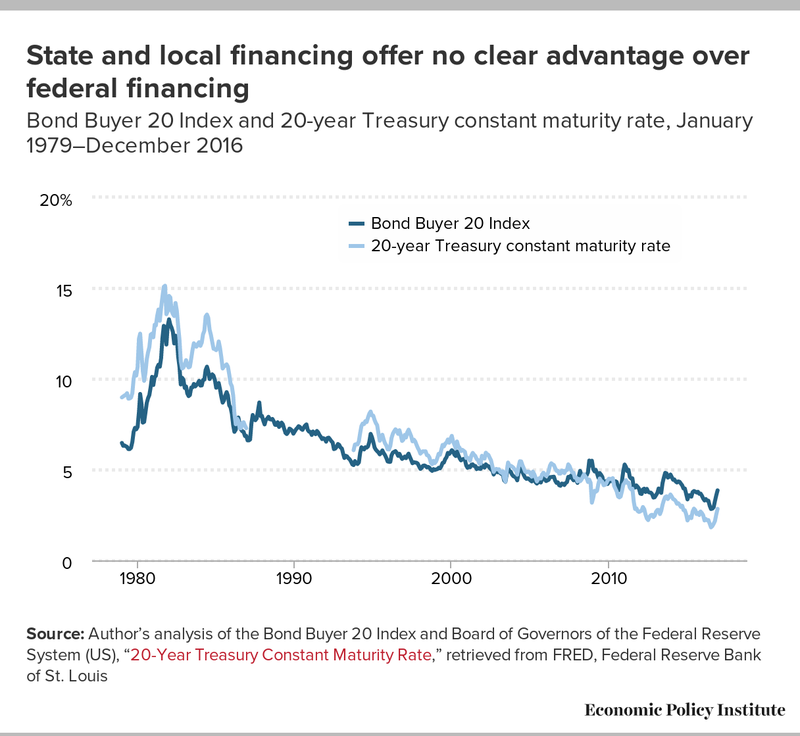 For bond financing, there isn’t any particular reason to believe that financing of infrastructure by states or localities is more efficient than federal financing. Figure H compares 20-year Treasury rates with the Bond Buyer 20 Index. The pre–Great Recession advantage of municipal bonds (from 1979 to 2007) is almost surely driven by their federal tax advantages, and these tax advantages actually make municipal financing more expensive overall than the interest rates alone would indicate, as the federal government is deprived of tax revenue that would otherwise be derived from municipal bond interest income. In the post–Great Recession period, Treasuries have seen their rates fall below those of municipal bonds even without the former’s tax advantages. This is clearly being driven by widespread sentiment that Treasuries are less risky than any other bond vehicle, including municipal bonds. Another growing source of infrastructure financing at the state and local levels is public-private partnerships (P3s). However, there may be reason to believe that, at least in some cases, P3s are less efficient economically than other forms of financing. If P3s are in fact not economically efficient, then the federal government could help state and local governments avoid P3 usage by providing funding to relieve some of the resource constraints (often driven by political considerations as much as economic ones—see Blair 2017) that push them to use P3s. On the other hand, P3s with appropriate contracts may offer more efficiency for certain projects. As mentioned above, though, state or local governments may lack the resources to effectively contract and regulate P3s. The federal government could play a useful role in providing assistance and institutional knowledge to states and localities on effectively negotiating P3 contracts and using P3s. Indeed, one of the strongest arguments for a national infrastructure bank is that a strong, centralized source of federal expertise in managing and regulating P3s can provide technical assistance and advice for state and local governments looking to tap private finance. Another concern to factor in when exploring the relationship between financing and economic efficiency is the externalities associated with climate change. A significant public investment in green energy would help combat global climate change and, as Bivens (2014) explains, current generations need not sacrifice economic efficiency in order to make this investment. Current consumption levels can be maintained by decreasing investment in the conventional capital stock as we increase our investment in green energy. Given that private-sector capital is drive by profitability, it is likely these particular marginal investments in the conventional capital stock are economically inefficient as they do not take into account the unpriced externality of carbon emissions. The unpriced externality of carbon emissions means that a deficit-financed public investment in green energy would combat global climate change while being economically efficient. However, if the decision of whether or how much to invest in green energy is left up to the states, those investments may be inconsistent. The federal government is likely best positioned to increase the deficit to finance these investments and crowd out economically inefficient (due to the unpriced externality) private capital nationwide. As discussed above, externalities are an important part of the equation when seeking to maximize economic efficiency in infrastructure investment. In this section, we take a closer look at the relationship between externalities and public investment—a relationship that is often overlooked in discussions of the roles of federal, state, and local governments in infrastructure investment. An externality exists when another party benefits or is harmed by the actions of an economic actor. One of the more common examples is pollution of a river. The owners of a factory upstream are not affected when they pollute a river as long as they are not charged for discharging pollutants into it; instead, the household downstream incurs the pollution’s costs. The economic prescription for this inequitable situation is to make the user internalize the externality, that is, make the polluter incur a sufficiently high cost—one that reflects the real costs of the pollution in terms of its harm to others and to the environment. One way to do this is to put a tax on pollution; another is to create a market for pollution rights with a system such as cap and trade that puts a price on emissions. In an earlier discussion, we ignored externalities when discussing the gas tax; now we consider those externalities. In order to mitigate climate change, carbon emissions need to be decreased. And while the gas tax has lost some efficiency as a pricing mechanism—as it looks less and less like a user fee—it does help attach a price to carbon emissions from vehicles and is therefore more efficient than it appears to be when only considering its value as an approximation of road usage. As we have noted before, if carbon pricing is left up to the states, some states may not pay their full share of the costs and users in those states may not incur sufficiently high costs to disincentivize carbon emissions. A substantial federal role in addressing the impacts of carbon emissions—both through appropriate pricing and through infrastructure investments (green energy investments to mitigate carbon emissions and other investments for adaptation to the impacts of climate change)—may be appropriate. While we argue that pricing mechanisms have more to do with assigning costs to beneficiaries than with which level of government does the funding, the typical efficiency case—which argues that the federal government should take on projects of national significance—itself implies a strong federal role for most infrastructure projects because of infrastructure’s network characteristics. What we think of as “core” infrastructure is usually part of a network—think of the nation’s roads and bridges, airports, waterways, or broadband. Here, we look at three different economic aspects of infrastructure networks and how they imply a strong role for the federal government. What is typically referred to in economics as “network effects” are essentially economies of scale in consumption. Economies of scale in consumption mean that the benefits of a good or service increase with an increase in the number of users in the network. The typical example is telephones. If only one person owned a telephone, that telephone would be useless. But as more people own telephones, the value of having a telephone to each individual person increases. These network effects are often present in infrastructure—for example, airports or broadband. Broadband internet access is more valuable the more people and organizations are connected to it. Likewise, one airport is not particularly useful. But with many airports come many destinations, making each airport in turn more valuable. When such network effects are present, there is a clear onus for the federal government to play a major role. Individual states and localities do not internalize the benefits they confer on others when they provide an additional node in the network. The federal government sits in an ideal place to recognize this value and reach a more economically efficient outcome. As we noted previously, because of the network characteristics of infrastructure, not all of the benefits from a particular piece of infrastructure are realized by the state or locality in which the infrastructure is built. Infrastructure built in one area interacts in various ways with infrastructure in other areas to generate spillover effects. Infrastructure investments in one city may provide benefits to cities connected to it in a network; conversely, the investments may draw in economic activity from connected cities, having negative economic effects on those cities. An individual state or local government will not internalize the effects—whether positive or negative—that their investments have on other cities or regions. The federal government may be in a better position to take spillover effects into account and therefore boost the economic efficiency of an infrastructure investment. The literature assessing the macroeconomic effects of public investment on productivity includes discrepancies between aggregate- and regional-level estimates that could be explained by spillover effects. The evidence we have discussed for large positive effects of public investment on output has largely utilized aggregate data. And these effects have not been typically found at the regional level (Pereira and Andraz 2013). Spillover effects are one possible explanation, since these effects would be captured in aggregate-level studies but not in studies focused on the regional level. Pereira and Andraz (2013) note that these spillover effects have been little studied, possibly because when researchers have used regional data, the general results of the effect of public investment on output have been inconclusive: some studies find that public investment has positive but smaller effects on output at the regional level compared with the aggregate, while others do not find effects at the regional level. However, one study that does explicitly look into spillover effects finds that only 20 percent of the aggregate effects of public investment in U.S. highways occur in the state itself where a particular highway is located (Pereira and Andraz 2004). International evidence for the impact of public capital at the regional level has been similar to the U.S. evidence (Pereira and Andraz 2013). The degree to which regional and aggregate benefits of infrastructure diverge due to spillovers will depend on the extent to which the infrastructure investments have been coordinated or not between levels of government. As we have noted, spillover effects can be positive or negative. And it is plausible that positive spillover effects are more likely when investments are coordinated. Such an understanding would be consistent with the inconclusive results of the effects of public investment at the regional level. While the effects of coordinating infrastructure investments have been little studied, one recent paper does attempt to disentangle the different possible spillover effects to isolate the role played by coordinated investments—those focused not on local objectives but rather with a coordinated aim to cause positive spillover effects. Looking at data on Italian regions, Di Giacinto, Micucci, and Montanaro (2012) find positive effects on output from both coordinated and idiosyncratic infrastructure investment but find that the positive effects of coordinated investment are substantially greater than for noncoordinated investment. If spillover effects are substantial, as the economic evidence so far suggests, the federal government can increase the efficiency of infrastructure investments by helping to coordinate investments that will result in positive spillovers and discouraging those projects with negative spillover effects. One objection that might be made to this—as well as to the argument for a strong federal role stemming from the network effects discussed in the last section—is that such efficiencies could be replicated by state and local governments cooperating to act together. While in theory this is possible, it seems unlikely in practice. Again, we point to the recent example of transponders in electronic tolling—the takeaway from this example being that smaller regional cooperation seems possible in practice, but broad cooperation looks to be more difficult. As of 2014, a driver from Florida, Georgia, or North Carolina (using North Carolina’s cheaper transponder version) can use a SunPass, Peach Pass, or NC Quick Pass in any of those three states (FDOT 2014). But as soon as that driver hits Virginia and the mammoth E-ZPass system that is used for electronic tolling throughout much of the Northeast and Midwest, the driver’s transponder will no longer work. This despite the fact that North Carolina offers a more expensive transponder that is already interoperable with E-ZPass (North Carolina Turnpike Authority 2017)—so North Carolina clearly has the capability for interoperability—and the fact that the MAP-21 Act requires “that all Federal-aid highway toll facilities provide for the interoperability of electronic toll collection by October 1, 2016” (FHWA 2012). Given that states have not managed to achieve widespread interoperability of electronic tolling systems, it seems unlikely that states would be able to cooperate on infrastructure investments with positive network and spillover effects. Often the goods and services provided by infrastructure networks act as intermediate goods to the production process of private firms. Problems with electricity generation or transportation will not confine themselves to those sectors. They will reduce output throughout other sectors of the economy, with knock-on effects causing problems further down the line. Jones (2011) builds a model taking into account such linkages and finds that disruptions to intermediate goods are easily quantifiable and have large multipliers—reducing output in economies substantially. In any production process, there are many things that can go wrong that will sharply reduce the value of production. In rich countries, there are enough substitution possibilities that these things do not often go wrong. In poor countries, on the other hand, any one of several problems can doom a project. Obtaining the instruction manual (the “knowledge”) for how to produce socks is not especially useful if the import of knitting equipment is restricted, if replacement parts are not readily available, if the electricity supply is erratic, if cotton and polyester threads cannot be obtained, if legal and regulatory requirements cannot be met, if property rights are not secure, or if the market to which these socks will be sold is unknown. In other words, a production chain is only as strong as its weakest link. This theory is harder to quantify, and Jones’ results may be empirically smaller than one may have expected because of firms’ ability to substitute. But in terms of infrastructure, there’s a connection back to the linkages. If one state decides not to keep up its interstates, the effects of that decision will be felt throughout the regional and national economies. Trucks would have to choose between taking an alternate route around the state or driving on the poorly kept roads, thereby increasing the wear and tear on their trucks—either choice results in decreased productivity. And the linkages of infrastructure with the broader economy would imply knock-on effects lowering productivity throughout. Infrastructure is often provided as part of a network, and to maintain economic efficiency that network needs consistent quality throughout. Consistent quality ensures that disruptions are not multiplied throughout the production chain. These networks benefit the nation’s efficiency as a whole and so shouldn’t be allowed to vary in quality because of particular state and local government funding decisions. Again, the federal government may be better positioned to take these network benefits into account when making infrastructure investment decisions than individual states or localities would be. A national smart grid is an excellent example of the type of infrastructure investment that could benefit from a strong federal role. Historically, electricity has been provided according to a hub-and-spoke model: generating power at a plant and sending it out to consumers. The large fixed costs and low marginal costs associated with this model has meant that, like most forms of infrastructure, electric utilities have exhibited natural monopoly characteristics. In practice, this often led to quasi-public entities being formed; these entities were regulated to charge rates that covered fixed costs and variable costs and provided a reasonable return to investors. However, new technologies are changing the way electricity can be provided and reducing the barriers to entry such that now only the grid itself has the characteristics of a natural monopoly (Roberts 2015a). While the work to create smart grids will likely proceed from the state and local levels in the coming years (Roberts 2015b), the network characteristics mean that a strong federal role in expanding the grid nationwide could boost efficiency. Roberts (2015a) explains that with a smart grid, the everyday household will not be just a consumer of electricity anymore. As the cost of installing solar panels on residential and commercial rooftops continues to fall, more households and businesses will be able to invest in this technology and not only generate their own electricity but also provide electricity back to the grid. And as the costs of batteries fall and the number of plug-in electric vehicles rises, these households and businesses will be able to increase their capacity to store excess energy, either for their own later use or to sell back to the grid at peak demand (and therefore peak pricing) periods. ICT (information and communications technology) allows automated smart appliances and home management systems to do the work of both supplying to and consuming from the electrical grid. Couple this with the falling costs of natural gas and wind energy, and it’s clear that the barriers to entry into the electricity generation market have lowered substantially. In effect, electricity can now be produced more efficiently in a competitive market. What remains to be done to facilitate this is a substantial improvement in the electrical grid. The intermediate goods role of electricity means that the knock-on effects on overall output could be substantial but would not be entirely internalized by state and local governments acting on their own accord. The federal government is in a position to internalize the potential increases to productivity broadly and spread the benefits of an improved electrical grid throughout the nation. Though this report has emphasized what economic efficiency considerations imply for defining the appropriate role of federal, state, and local governments in infrastructure investment, policymakers do not typically constrain themselves to just considering economic efficiency. Objectives outside of economic efficiency also matter a great deal. Several methodologically sound papers have suggested that countries with larger public capital stocks tend to have greater equality of incomes (see, for example, Calderón and Servén 2004). This should not be a shock—by its nature public capital is more broadly based in its ownership than private capital (in the United States, the wealthiest 1 percent of households own more than 40 percent of private wealth) and so its benefits should be more broadly distributed (Getachew 2008). A federal investment allows for the broad-based benefits of public investment to be felt nationwide, but individual state and local governments’ infrastructure investment could provide broad benefits as well. Equity considerations seem to more explicitly define a major role for the federal government. Often, a political consensus has formed that some service, such as clean drinking water, should be available to all citizens regardless of where they live or their ability to pay. Once such a policy goal has been established, there is no reason to leave the implementation of that goal to state and local governments. If a particular service is to be available to all citizens, then the federal government is best positioned to guarantee that access. For example, if we want affluent residents of Mountain View, California, to help pay to replace lead water pipes in Flint, Michigan, that is best done through federal policy. Other broad national goals would also imply a significant federal government role for infrastructure investment. Sustainability and energy efficiency could be positive goals in their own right, particularly in the absence of an established price on carbon emissions. The federal government can play a role in promoting such goals through the infrastructure sector. This touches back on a previous point. In the case of carbon, this constitutes the federal government internalizing an externality—in effect reaching what is actually a more economically efficient allocation of resources. That is, when economic efficiency does drive policymaking decisions, those decisions should get the measure of efficiency right. Often, as is the case with carbon emissions, this implies a substantial federal role. Too often it is taken for granted that state and local policymakers are better positioned than federal policymakers to match infrastructure levels to the needs and preferences of users—under the assumption that the primary users are their constituents. This kind of reasoning is used to argue that more of the responsibility of infrastructure investment should be shifted onto state and local governments—even though they already account for the majority of public spending on infrastructure. 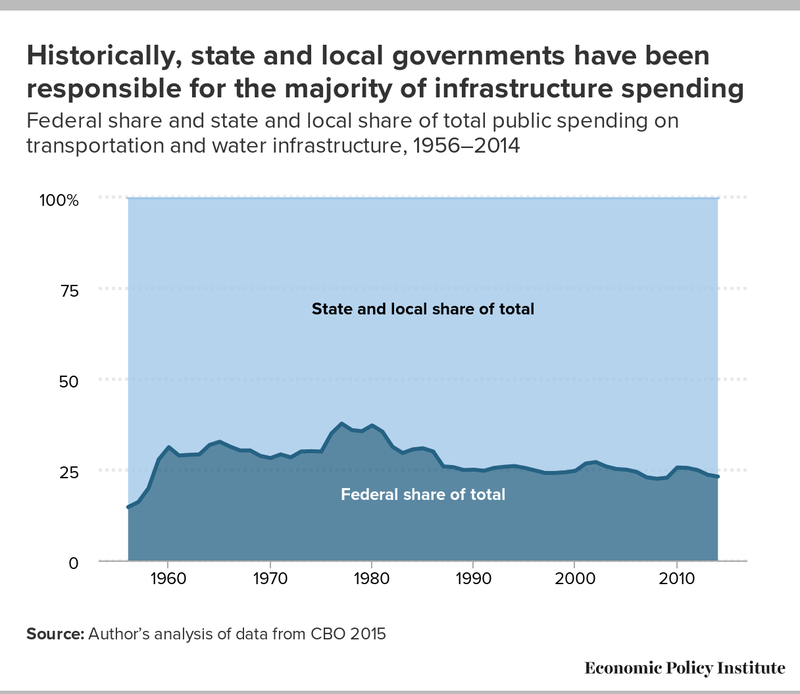 (For instance, as shown in Figure B above, state and local governments accounted for 77 percent of public spending on transportation and water infrastructure in 2014.) If economic efficiency is the aim, pricing mechanisms provide a far better tool for assigning costs to the appropriate infrastructure beneficiaries than any attempt to separate beneficiaries among different levels of government. Further, the network characteristics associated with many types of infrastructure suggest that a strong federal government role could help to ensure economic efficiency. State and local governments are unlikely to take such effects into account when making infrastructure investment decisions. And when efficiency is measured correctly, it often implies a substantially stronger federal role; for instance, there are efficiency benefits from decreasing carbon emissions to mitigate future climate change, but if the decision to invest in green energy is left up to the states, those investments may be inconsistent. Outside of efficiency, the federal government is best situated to ensure that national policy goals beyond economic efficiency are achieved—such as providing all citizens clean drinking water or ensuring that the benefits of investment flow further down the income distribution than they have in past decades. 1. Here we define “core” infrastructure as transportation and water infrastructure. The data presented in this report focus on these investments, but we also discuss other infrastructure investments as we explore what roles might be played at different levels of government; examples of other investments include green energy, smart grids, and broadband. 2. The Congressional Budget Office defines transportation infrastructure as including all national, state, and local roads, bridges, tunnels, mass transit, rail, aviation, and water transportation. It defines water infrastructure as including water containment systems, sources of fresh water, and water utilities. 3. This type of self-fulfilling liquidity crisis has been a key feature of the Eurozone crisis in recent years, as member countries issue debt in currency that they cannot print. See De Grauwe and Ji 2012 for evidence that even states that have fiscally sustainable deficit positions may be pushed into default by herd-driven financial markets if they do not control their own currency. 4. We define recession period as the time period from the peak to one full year after the trough of a recession. 5. State and local infrastructure investment is a significant subset of state and local gross investment. 6. For example, 40 percent of P3s in the U.S. transportation sector have undergone renegotiation. See Blair 2017 and Engel, Fischer, and Galetovic 2014. Aschauer, David A. 1989. “Is Public Expenditure Productive?” Journal of Monetary Economics vol. 23, no. 2, 177–200. Aschauer, David A. 1990. “Does Public Capital Crowd Out Private Capital?” Journal of Monetary Economics vol. 24, no. 2, 171–88. Bivens, Josh. 2014. The Short- and Long-Term Impact of Infrastructure Investments on Employment and Economic Activity in the U.S. Economy. Economic Policy Institute Briefing Paper no. 374. Bivens, Josh. 2017a. A “High-Pressure Economy” Can Help Boost Productivity and Provide Even More “Room to Run” for the Recovery. Economic Policy Institute report. Bivens, Josh. 2017b. The Potential Macroeconomic Benefits from Increasing Infrastructure Investment. Economic Policy Institute report. Bivens, Josh, and Larry Mishel. 2015. Understanding the Historic Divergence between Productivity and a Typical Worker’s Pay: Why It Matters and Why It’s Real. Economic Policy Institute Briefing Paper no. 406. Blair, Hunter. 2017. No Free Bridge: Why Public–Private Partnerships or Other “Innovative” Financing of Infrastructure Will Not Save Taxpayers Money. Economic Policy Institute report. Board of Governors of the Federal Reserve System (US). “20-Year Treasury Constant Maturity Rate.” Retrieved from FRED, Federal Reserve Bank of St. Louis. Bond Buyer. 2016. Bond Buyer 20-Bond GO Index. Bureau of Economic Analysis (BEA). Various years. National Income and Product Accounts (NIPA) Tables [data tables]. U.S. Department of Commerce. Congressional Budget Office (CBO). 2015. Public Spending on Transportation and Water Infrastructure, 1956 to 2014. De Grauwe, Paul, and Yuemei Ji. 2012. “Self-Fulfilling Crises in the Eurozone. An Empirical Test.” CESifo Working Paper no. 3821. Di Giacinto, Valter, Giacinto Micucci, and Pasqualino Montanaro. 2012. “Network Effects of Public Transport Infrastructure: Evidence on Italian Regions.” Banca D’Italia Working Paper no. 869. Engel, Eduardo, Ronald Fischer, and Alexander Galetovic. 2014. The Economics of Public-Private Partnerships: A Basic Guide. New York: Cambridge Univ. Press. Federal Highway Administration (FHWA). 2012. Moving Ahead for Progress in the 21st Century Act (MAP-21): A Summary of Highway Provisions. Florida Department of Transportation (FDOT). 2014. “FL’s SunPass, GA’s Peach Pass, and NC’s NC Quick Pass Now Valid in All Three States: Electronic Tolling Systems Interoperable Allowing for Inter-State Toll Payments” [news release]. Geddes, Richard. 2015. “America’s Transportation Challenges: Proposals for Reform.” AEI Economic Perspectives, American Enterprise Institute. Government Accountability Office (GAO). 2005. Air Traffic Control: Characteristics and Performance of Selected International Air Navigation Service Providers and Lessons Learned from Their Commercialization. Heintz, James. 2010. “The Impact of Public Capital on the U.S. Private Economy: New Evidence and Analysis.” International Review of Applied Economics vol. 24, no. 5, 619–32. Jones, Charles I. 2011. “Intermediate Goods and Weak Links in the Theory of Economic Development.” American Economic Journal: Macroeconomics vol. 3, no. 2, 1–28. McNichol, Elizabeth. 2017. It’s Time for States to Invest in Infrastructure. Center on Budget and Policy Priorities. North Carolina Turnpike Authority. 2017. “Transponders and Rates.” Accessed July 10. Pereira, Alfredo, and Jorge Andraz. 2004. “Public Highway Spending and State Spillovers in the USA.” Applied Economic Letters vol. 11, no. 12, 785–88. Pereira, Alfredo, and Jorge Andraz. 2013. “On the Economic Effects of Public Infrastructure Investment: A Survey of the International Evidence.” College of William and Mary Department of Economics Working Paper no. 108. Roberts, David. 2015a. “Power Utilities Are Built for the 20th Century. That’s Why They’re Flailing in the 21st.” Vox, September 9. Roberts, David. 2015b. “Reimagining Electric Utilities for the 21st Century.” Vox, September 11. U.S. Census Bureau. Various years. State and Local Government Finance [data tables]. U.S. Federal Highway Administration. “Moving 12-Month Total Vehicle Miles Traveled.” Retrieved from FRED, Federal Reserve Bank of St. Louis.